This Jewish twist on How the Grinch Stole Christmas tells the story of the Hanukkah celebration that almost didn't happen. The town of Oyville is alive with the spirit of the season. Brilliant menorahs glow in windows, and children spin dreidels and nosh on latkes. However, not everyone in Oyville delights in the celebration. High on a hill, a cranky kvetch complains about Hanukkah upon each passing season. So this year, he sneaks into Oyville to steal the holiday. 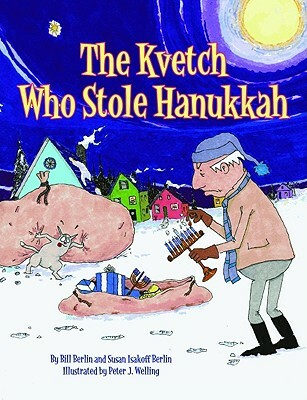 When the children realize their menorahs are missing, they try to convince the kvetch that Hanukkah is about joy, justice, and charity. But can he have a change of heart? Complete with clever rhymes and Yiddish terms, this story presents Hanukkah, the Jewish Festival of Lights, in a child friendly format. Peter J. Welling's quirky art adds to the festive fun.